Amazing 360 Panorama Gigapixel Cam from the BT Tower in London! If you are looking for some breath taking views of London, England, then look no further! Thanks to the MyLiveStreams new Gigapixel Cam Section you can now check out some of the most spectacular views of London with the record breaking BT Tower London Gigapixel Panoramic Cam! With a resolution of 320 Gigapixels, this astonishing 360 degree Panoramic View is the best and largest picture in the world. Panoramic View of London is a great way to spot your favorite locations in the City. The picture has taken over 3 months to make with a total of 48,640 individual images taken by four cameras set up on the 29th floor of the BT Tower in London. After the images were all taken, they were put together by specialist computer software which took 3 months to ensure all the pictures were sewn together properly and to create the 360 degree panorama effect. It is estimated that if the full image was to be printed, it would be up to 98 meters wide and 24 meters tall. As mentioned above the BT Tower London Gigapixel 360 Panoramic Cam holds the world record for highest amount of Gigapixels with a whopping 320 Gigapixel Resolution!! The previous world record holder was the Panoramic Gigapixel View of Dubai, this is also available in the MyLiveStreams Gigapixel Cam Section, but is only a mere 45 Gigapixel resolution. More and more Gigapixel Cam pictures are appearing on the internet, they have proved to be an excellent promotion for any major city and landmark. Thanks to MyLiveStreams and their new Panorama Gigapixel Cam Views section, it is extremely easy to find some of the best Gigapixel Cam Views from all over the world. 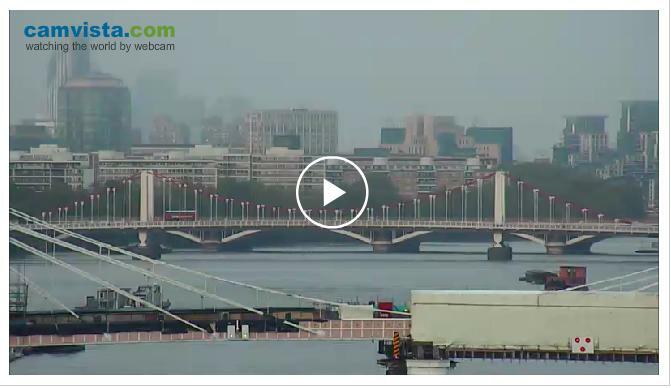 With views of Sevilla, London, New York, Dubai and Paris, MyLiveStreams already boast to have the only Gigapixel Cam Views Directory on the internet. Check out some of the great Gigapixel Cams now on MyLiveStreams.com. The formal River Thames Boats Pageant will start at 2pm (BST) and finishes at 6pm (BST). Watch the boats taking part in the River Thames Royal Pageant assemble infront of the Battersea Bridge on the River Thames in the early hours of Sunday morning to take part in the formal river procession with Her Majesty The Queen at 2pm on Sunday afternoon by viewing our streaming LIVE River Thames web cam.